#222 - One rainy morning. During a visit in the summer capital was a rainy morning, I was supposed to go around the city but didn't have any umbrella. So I stayed under a shade, a concrete overpass and photograph people as they brave the rain. 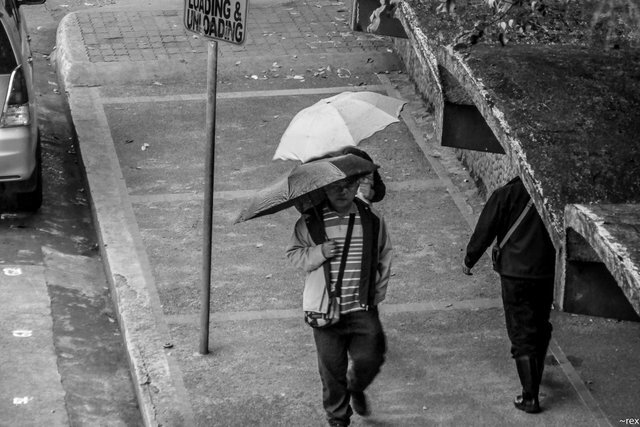 Shot in Baguio City. Great photo @allmonitors and you have chosen a good place for shooting! @allmonitors, Lite Sprinkles of rain makes the environment so wonderful and breathtaking and yes, it inspire us to enjoy the moment. Hope that next time you will going to enjoy this moment. I know that you are always giving the road photography, which is actually very beautiful and one is better when it rains in front of the road in front of the road, it looks more beautiful, the morning rain is actually very beautiful.